The Laughing Drum is a weekly satirical news and talk show that takes a sharply humorous look at Canadian and Indigenous politics, entertainment, arts and current events. In each episode, host Tim Fontaine uses actual news footage, field segments, interviews with guests and the Red Power Panel to dissect the issues facing Indigenous Peoples today. 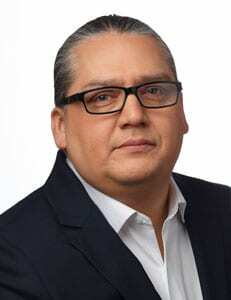 Before becoming the host of the Laughing Drum, Tim Fontaine was a journalist for nearly two decades and worked for APTN National News, APTN’s former flagship call-in show Contact and was lead reporter for CBC’s Indigenous unit. He also produced programs for Toronto-based iChannel, including the Canadian Screen Award-nominated Transgender Project. Anishinaabe from the Sagkeeng First Nation in Manitoba, Tim lives in Winnipeg with his partner Martha and is a proud father to two boys.